In 1877 H. M. Restarick took over Johnson’s shipyard, which appears to have lain on the site of The Key. In 1881 the Manor lands, with the express exclusion of Restarick’s shipyard, were sold to the Borough of Bideford. The Ordnance Survey 1-2500 map of 1888 (surveyed in 1886) shows the main channel of the Torridge indisputably occupying a western position. 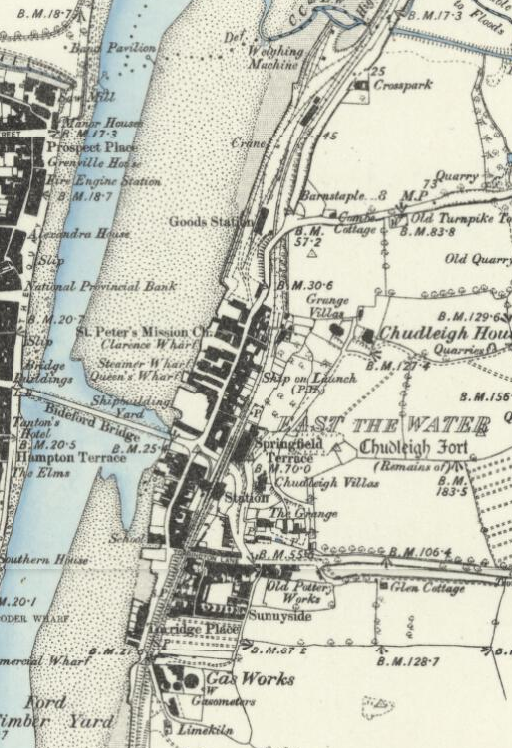 On the eastern side, as one moved north from the Long Bridge, are marked: a shipyard (Restarick’s); Queen’s Wharf; Steamer Wharf; Clarence Wharf; St Peter’s Mission Church; a goods station and railway sidings.